Rescued from near extinction by Ted Chewning, Jimmy Red corn was already making waves in the culinary world when we opened our doors in 2013. 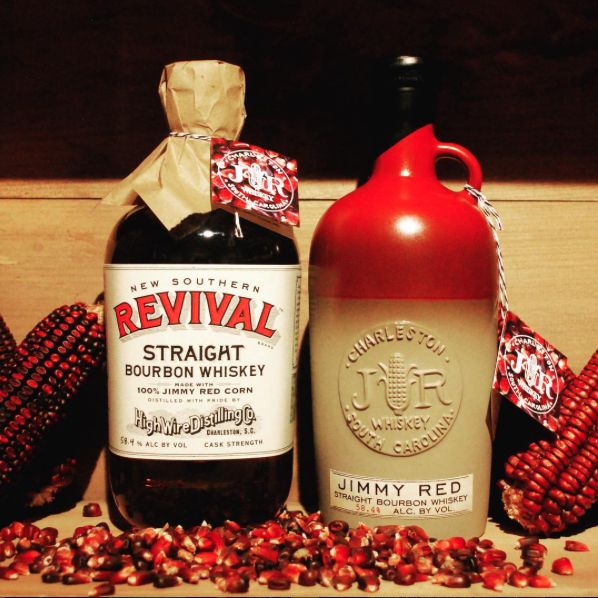 Named for James Island just over the bridge from Charleston and heralded by Chef Sean Brock, Jimmy Red was a legendary moonshiner's corn that had dwindled down to a mere 2 cobs following the death of the last man known to grow it. His family gave the seeds to Ted who began the arduous process of bringing it back to life. Through the efforts of folks like Ted, Glenn Roberts of Anson Mills, Greg Johnsman of Geechie Boy Mill, and Sean Brock, Jimmy Red corn seed reserves were slowly being rebuilt. In 2015, thanks to the diligence of Dr. David Shields of University of South Carolina, Jimmy Red corn was accepted as a new addition to the Slow Food Ark of Taste, an international catalog of endangered heritage foods. In early 2014, just a few months after we opened, Glenn Roberts entrusted us with enough Jimmy Red corn seed to grow 2.5 acres. We grew it in partnership with Dr. Brian Ward at Clemson University and harvested enough corn to distill 2 batches of the most unique bourbon we have ever tasted. With each passing year, our planted acreage of Jimmy Red has grown exponentially with an expected harvest of 250,000 pounds in 2017. 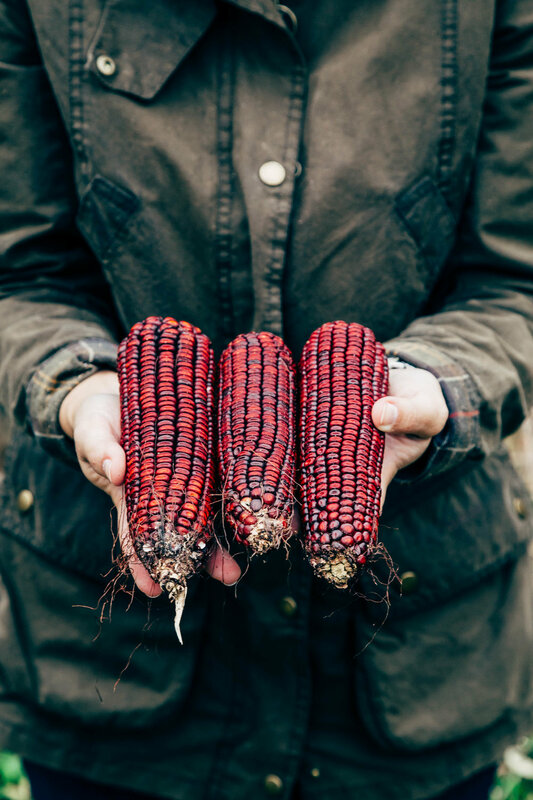 Jimmy Red corn is the most remarkable corn we've ever worked with. Nutty, sweet, and mineralic with an extremely high oil content, the fermented mash produces a 3" thick oil cap. We distill on the grain, so all of that oil is blended back into the mash and provides an unusually creamy mouthfeel in the distillate. The Jimmy Red whiskey is aged for a minimum of 2 years, creating a straight bourbon unlike any other we've ever experienced. The 2018 release of Jimmy Red Bourbon will occur on December 1st at which time we'll offer for sale a limited number of our beautiful ceramic bottles produced by our friends at Le Creuset as well as our New Southern Revival Brand glass bottles. For more information on how to purchase these special releases, please sign up here for our newsletter. In mid-November, we will begin issuing updates via our email newsletter and social media. There are a few ways to secure a bottle during our special release time period. At 10am EST on release day, bottles will go on sale at the distillery for in-person purchase. At 1pm, we will open online reservations for bottle purchases to be held at the distillery for pick-up. These bottles must be picked up by January 31st, 2019. There is a 3 bottle limit per person per day on purchases from the distillery. If you cannot make it to Charleston, please order through our online retail partner, Astor Wines, in NYC. Astor Wines can ship to all states except Alabama, Alaska, Arkansas, Hawaii, Illinois, Iowa, Kentucky, Maryland, Michigan, Mississippi, Montana, New Hampshire, North Dakota, South Dakota, Tennessee, Texas, Utah, Virginia. Jimmy Red Bourbon will also be available for purchase at retail within our distribution network. For help finding a retailer near you, please visit our Purchase page.